Scientists at the University of Iowa have developed a vaccine that combats dust mite allergies by naturally switching off the body's immune response. It's welcome news for the millions of people who suffer from mite-induced breathing difficulties. Nearly 84% of households in the United States contain dust mites — microscopic organisms that feed on organic leftovers like flakes of human skin. They're a common cause of asthma and allergic symptoms; their guts contain potent digestive enzymes that hang-out in their feces — a major contributor to allergic reactions such as wheezing. But in animal tests, researchers demonstrated that a nano-sized vaccine package can lower lung inflammation by 83% despite repeated exposure to the allergens. The response happens because the vaccine package contains a booster that alters the body's inflammatory response to dust-mite allergens. "Our research explores a novel approach to treating mite allergy in which specially-encapsulated miniscule particles are administered with sequences of bacterial DNA that direct the immune system to suppress allergic immune responses," noted co-author Peter Thorne in a statement. 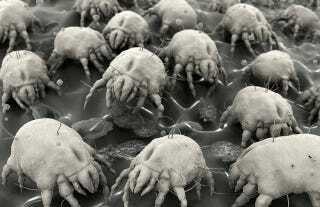 "This work suggests a way forward to alleviate mite-induced asthma in allergy sufferers." The UI-developed vaccine takes advantage of the body's natural inclination to defend itself against foreign bodies. A key to the formula lies in the use of an adjuvant—which boosts the potency of the vaccine—called CpG. The booster has been used successfully in cancer vaccines but never had been tested as a vaccine for dust-mite allergies. Put broadly, CpG sets off a fire alarm within the body, springing immune cells into action. Those immune cells absorb the CpG and dispose of it. This is important, because as the immune cells absorb CpG, they're also taking in the vaccine, which has been added to the package, much like your mother may have wrapped a bitter pill around something tasty to get you to swallow it. In another twist, combining the antigen (the vaccine) and CpG causes the body to change its immune response, producing antibodies that dampen the damaging health effects dust-mite allergens generally cause. The researchers will now work to see if the vaccine can be used to treat human patients. Read the entire study at AAPS Journal: "Development of a Poly (lactic-co-glycolic acid) Particle Vaccine to Protect Against House Dust Mite Induced Allergy".